An important story on the front page of Tuesday’s New York Times Science section documents the widespread phenomenon of teacher self-censorship – teachers avoid the “E-word” because of pressure from parents or administrators. The story is by Cornelia Dean. Here is the story: “Evolution Takes a Back Seat in U.S. Classes.” See discussion/commentary at NCSE News, Jason Rosenhouse’s EvolutionBlog, Pharyngula, and Chris Mooney’s blog. 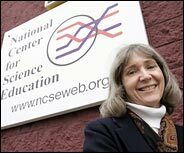 This is an implicit admission that the teaching of evolution doesn’t make the news when states such as Ohio, New Mexico and Minnesota adopt standards that teach all about the theory, including the scientific challenges to it, but only makes the news when the local amateur hour decides to downplay evolution or promote religion in science class. Why is the latter news, but the former is ignored or barely mentioned at best? Or, why doesn’t the teaching of evolution make the news when a parent is denied his civil rights by a Darwinist school board and then tries for some modicum of justice? Let’s see, how many distortions can we count in these three sentences? No actual modern peppered moth expert doubts that Kettlewell’s bird predation hypothesis for change in color is essentially correct, and in fact they are all incredibly annoyed at creationist/ID lying about their work. The entire creationist/intelligent case on the peppered moth is based on misquoting, sloppy research, and deliberate misrepresentation. See this page and links therein for documentation of the above. 2. No link is given for New Mexico, because the ID movement made no progress there. Be able to explain how scientific and technological innovations as well as new evidence can challenge portions of or entire accepted theories and models including but not limited to cell theory, atomic theory, theory of evolution, plate tectonic theory, germ theory of disease and big bang theory. 4. Larry Caldwell’s lawsuit in Roseville, California, is laughable. He basically distracted everyone in the school district for a whole year, including bringing in creationist Cornelius Hunter to give a presentation. Hunter reportedly did preposterous things like claim to show a side-by-side comparison of a placental wolf and a marsupial “wolf” – skulls which are actually readily distinguishable to anyone who can count teeth – and claimed they were identical. It turned out that Hunter had used the same photo twice in his presentation. After a year of this kind of pseudoscience circus, the school board voted down Caldwell’s policy, and Caldwell sued because, well, he was mad the board didn’t agree with him. What’s really funny is that the Discovery Institute is supporting Caldwell, considering that the lawsuit will almost certainly be summarily dismissed as patently ridiculous. No one but us professionals over at the Discovery Institute, I guess. Did it ever occur to the folks at the DI that all of their rhetoric might contribute to this? The ID movement’s notable actions include incessant talk about ID being a revolutionary new scientific movement, their legal analyses promoting the constitutionality of teaching ID, their continual mixing of religious apologetics with their “science” in any slightly sectarian setting, the stated motivations of virtually all of their leading figures, and their continual hobnobbing with the stupendously discredited Young Earth Creationists. Maybe, just maybe, these actions are what leads to “the local amateur hour” directly following the DI’s lead, just without quite the same level of sneakiness. The “local amateurs” know that this is all about getting a particular religious view into the public schools, and they say so until the lawyers get ahold of them, tell them to can it and to destroy the tapes (see “Dover tapes at issue”. York Dispatch, Febrary 1, 2005). Phew – well, that’s what it takes to deconstruct a mere three sentences of ID spin.